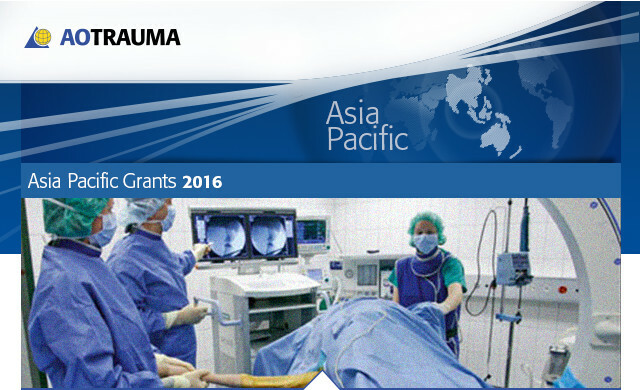 Funded by AOTrauma Asia Pacific (AOTAP), the AOTAP Research Grants provide one-year, stand-alone seed money to support innovative projects in the Asia Pacific Region dealing with trauma, surgery of the loco motor system, and related basic and clinical research. The Multi-Center Study Grant, also funded by AOTAP, supports projects dealing mainly in clinical studies (not laboratory or biomechanical studies) within the Asia Pacific Region. Applications for the AOTAP Research Grants 2016 and the AOTAP Multi-Center Study Grant 2016 are open to individual clinicians/researchers and research groups in the Asia Pacific Region. In addition, the applicant or one of the applicants of the research group MUST be an AOTAP committee member or AOTAP faculty. Applications for an extension of funding for a second year are subject to review and will be processed with the other new applications. All applications will be peer reviewed by at least two known experts. Due to limited financial resources, only a limited number of studies will be approved. To download all needed documents and for more information, please visit our website. Please email the completely filled-in forms as an unprotected document/PDF format, to: research@aotap.org. Please make sure you apply before June 30, 2016. Decisions will be communicated approximately five months after the deadline.